Last edited by ssg_butcher on Fri Dec 20, 2013 11:10 pm, edited 1 time in total. 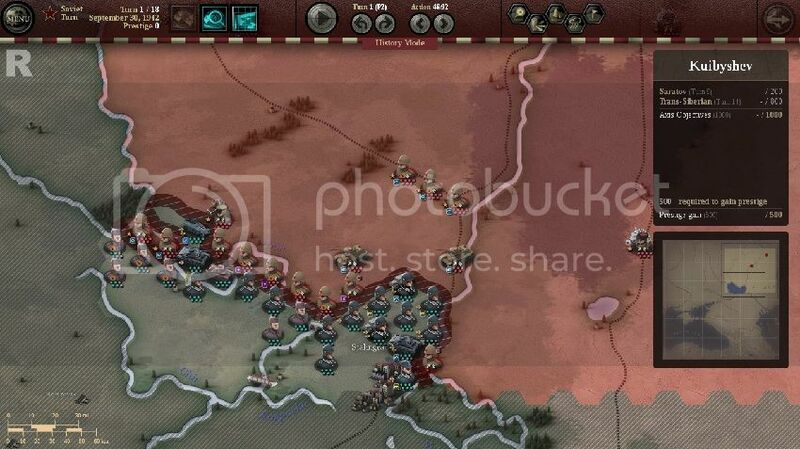 -My initial move completely cuts the southern Soviet army in two. -Constructing a bridge across the river will also ease the movement of troops and supplies. -After this initial turn almost all of my mechanized forces will swing north to capture the first two objectives by turn 4. 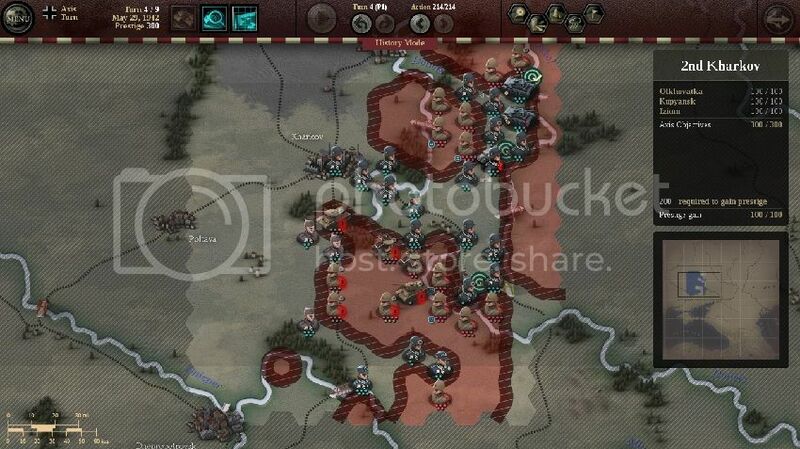 -I was able to maintain the large encirclement of the enemy at the end of each turn to keep them out of supply. -I also left one infantry unit in the southeast corner ready to cross the river. -I kept my forces in supply for one turn. 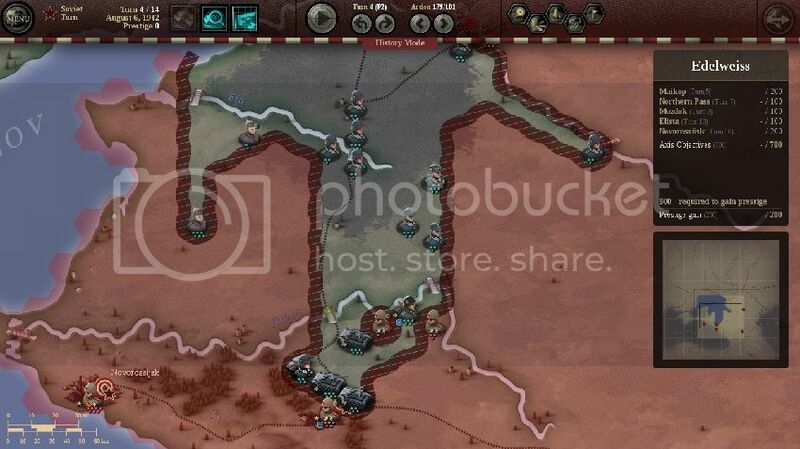 Since both objectives need to be taken on turn 3, I did not worry about my supply lines after turn two. -For Voronezh itself, I moved my forces into the hexes adjacent to the river at the end of turn two. Failing to do so will lead to problems capturing the objective. -As for capturing Liski, I ensured at least on of my armored units had crossed the bridge by the end of the 1st turn. Again I'd like to give thanks to ComradeP for this one. If it looks a lot like his AAR, well it's because I followed his strategy. This is a very large scenario with many moving pieces and objectives. Speed and supply are key here. 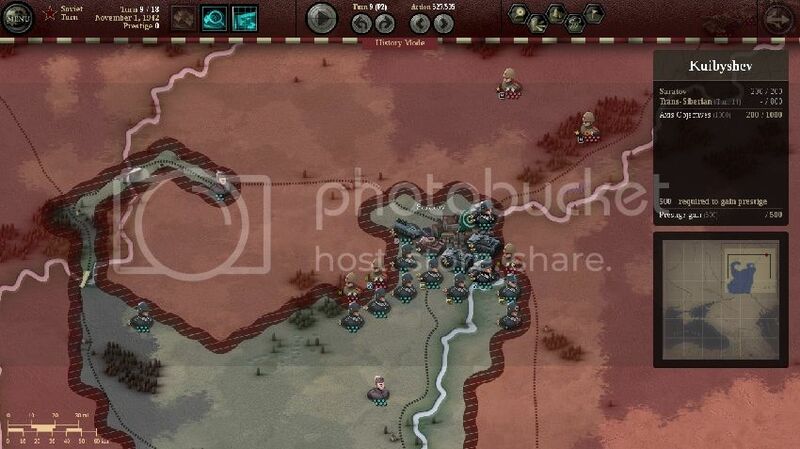 -In the northern portion I overran the infantry units with my tanks after resupplying them. I then had them make a run for Millerova ignoring everything else. -In the west and south I began a slow war of attrition to secure my supply line across the river and also use my mechanized units to punch a hole along the enemy front north of Rostov. -I also started to consider the two eastern objectives by sending my deployed mechanized units and infantry towards them. 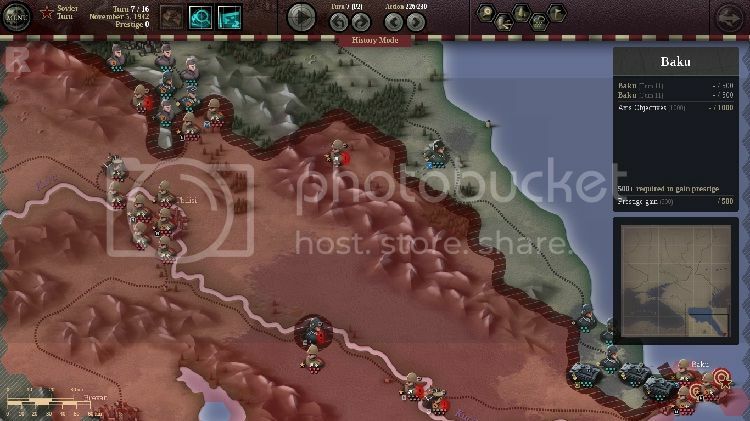 -Securing Rostov and the entire supply line by turn 5 allowed my entire army heading for the last two objectives to be resupplied. Supply, supply, supply. Is there a way to get a BV without using this strategy? I'd be very impressed to see one. -First I cleaned up the pocket in the center, smashing the infantry and attacking a couple of tanks. After that I ensured to withdraw all of my forces so they would be in supply. -Next I moved a tank and some infantry from my southern army toward the enemies southern supply point. I left my motorized infantry on the northern side of the bridge so I would have a secure foothold. -The enemy reacted to my threat by moving most of their forces south and a scant line was moved to defend against my western army. -During turn two I smashed this thin line in the west and quickly moved a tank unit and a motorized unit to disrupt the enemies northern supply lines. 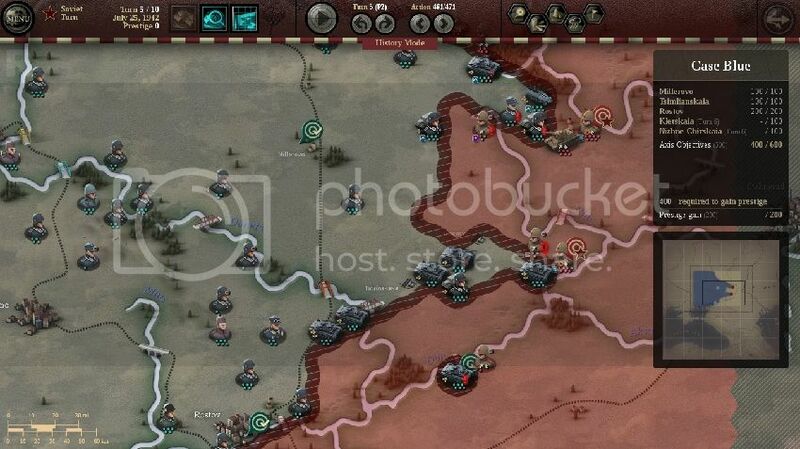 -After securing the two northern supply lines and the southern supply point I moved my southern tank unit across the river securing the supply point to Stalingrad itself. -I made sure to resupply the northeastern tank unit on turn 5 as the enemy receives fresh tank reinforcements on the next turn. I should have secured the territory between the points as this would have caused them to deploy on the other side of the river. -The rest was just a mop up operation and worrying about keeping my units supplied was the only challenge left. -I also placed most of my supply boosts on the northern supply but I've placed them all in the south on a previous playthrough. Both worked out fine. Rename this one "The Mad Dash for Maikop". This scenario gave me the most problems during this playthrough and I ended up having to restart many times. Maikop seemed absolutely impossible to take by turn 5 and I began getting very frustrated. The main reason for my poor play was I was trying to send the motorized unit in the northeast in a race to capture Elista. I had done this on a previous playthrough and it had worked fine. However I was using prestige at the time. After running into the brickwall known as Maikop many times I realized I needed every mechanized unit possible to take the objective, and there had to be a better way to capture Elista. I discovered if you send a single infantry unit along the south side of the river Manyeh and build a bridge across it, allows you to quickly outrun the enemy armies and capture the objective. Now with all of my mechanized forces rolling towards Maikop (and a few lucky rolls ) I was in business. -I used my tanks in the east to overrun the weaker infantry units and began to move them east in an effort to combine forces. -Using my infantry to weaken units and then overrunning them with my armor I was able to cover vast distances by turn 3. -At the end of turn 3 I built a bridge on the Kuban river just northeast of Maikop. This allowed me to pincer any units blocking the main bridge and my supply line. -I also sent some Non-German infantry units along the west coast to allow me to deploy units from my force pool in the future. -By the end of turn 4 I had placed a few hits on Maikop and was in a good position to dislodge the enemy on turn 5. -Not much else to worry about after taking Maikop. I split up my forces sending a tank and an infantry unit to take the Northern Pass and then moved on to the east and western objectives. A fairly simple and quick scenario. I do it without taking any of the cities. 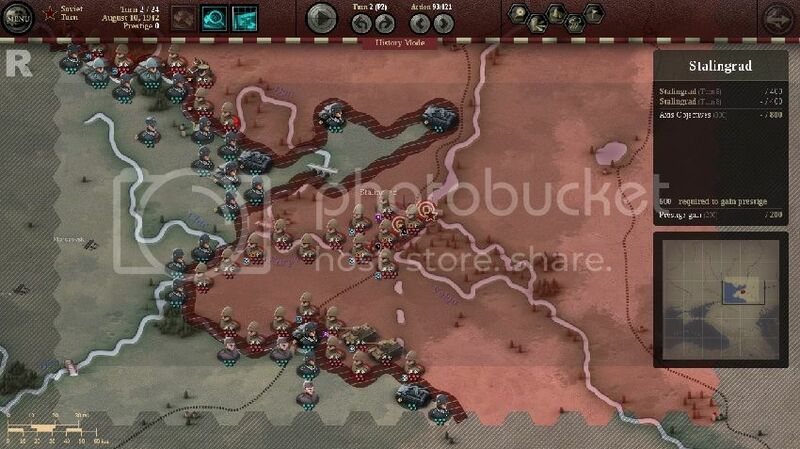 -I attacked the infantry unit across the river (Soviet unit 37A) with the 13PzD causing them to retreat. 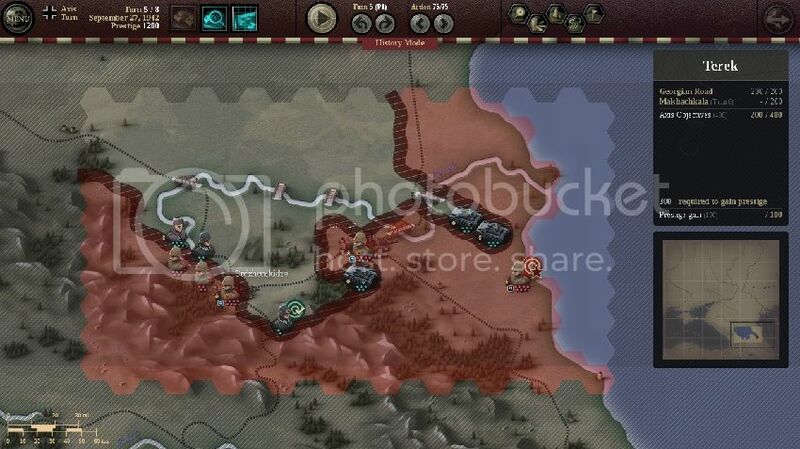 I then crossed the river with the 23 PzD and destroyed the NKVD unit. Do not waste your time attacking the NKVD unit from across the river as it will waste precious time. -I then took my eastern armor and wedged it between the Soviet Calvary unit and the Terek River. I was able to emplace a bridge and destroy the calvary. 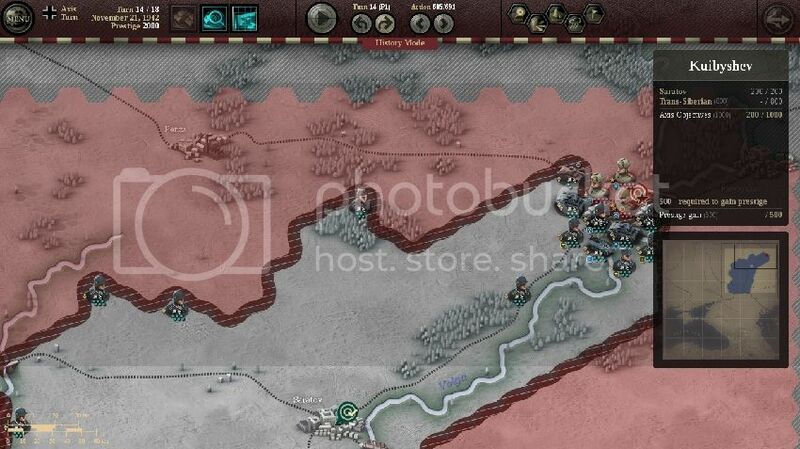 -Turns 2-4 I destroyed the forces around the southern objective using my two armor units and a single infantry unit. -The Romanian infantry and my other infantry unit remained west of the river to protect my supply line until the enemy began to retreat. 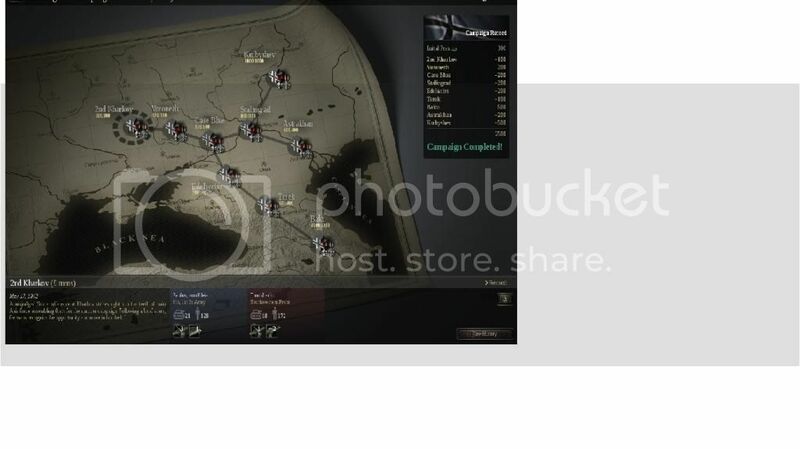 -I had the single armor unit in the east destroy any forces that may have impeded my advance on the eastern objective. I moved it in and out of supply ensuring it was in supply at the end of turn 4. -By turn 5 I had taken the southern objective and directed the two tanks that had just been resupplied east toward the final objective. -Again I never attempted to take any cities as there just isn't time for it. In a nutshell this scenario is just a race down the coast to Baku. Almost completely ignoring the western part of the battlefield and redirecting units to help out on the coast makes this scenario much easier. 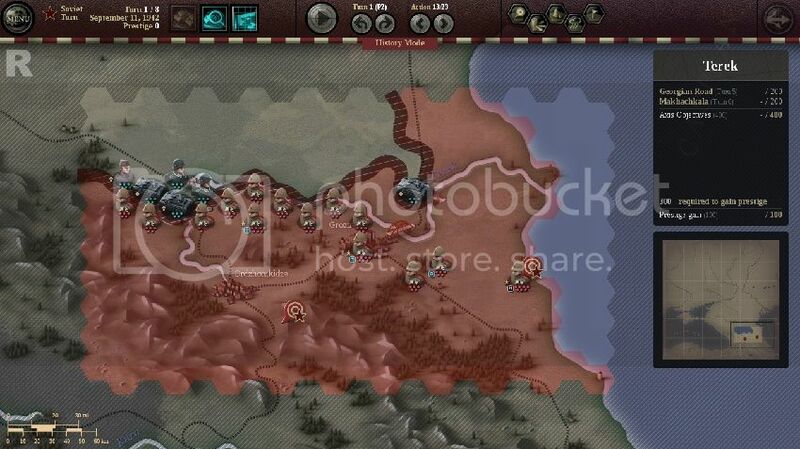 Your goal should be to try and have a foothold on the outskirts of Baku by the end of the Axis turn 8, as the enemy is reinforced at the beginning of it's turn. *One of the most important aspects of this scenario is that the forces along the enemy coast are resupplied by the supply line running south along the Kura River. 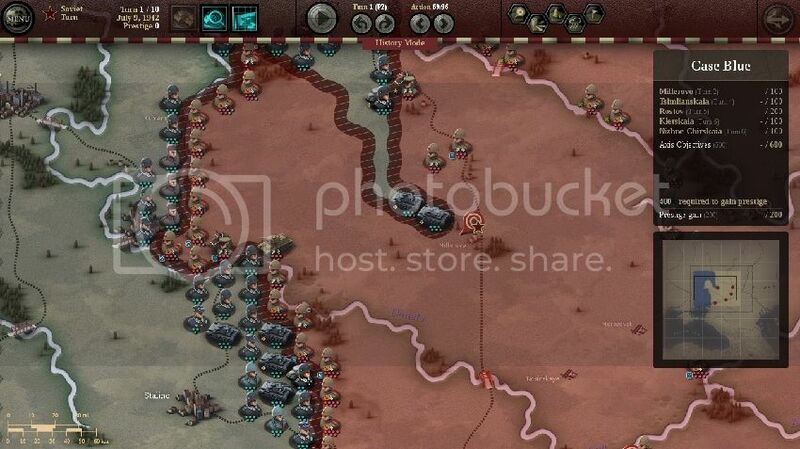 There is a supply point in Baku but it is not connected to a supply line, so the enemy has to be within 8 hexes of Baku to be resupplied. 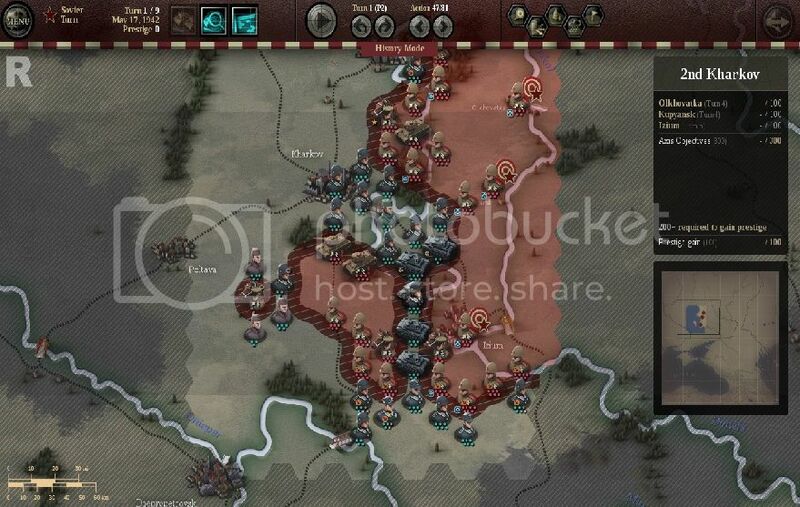 Utilizing a unit in your western force to cross the river and block the enemy's southern supply line will greatly help your advance along the coast. -I began by destroying some of the units along the coast road using my armor and infantry. -Clearing the enemy's zone of control with my motorized infantry in the west I was able to advance an infantry unit to the southwestern bend along the Kura river, ready to cross it on my next turn. -I also moved the single armored unit in the west near some favorable terrain in the mountains where he would be able to slowly cross over to join my forces along the coast. -I had all of my other forces in the northwest mountains dig in. -During turns 2-5 I continued my advance along the coast rolling over the unsupplied enemy units. -The enemy grew tired of the harrassment of his southern supply line and finally attacked my infantry unit on turn 5, and destroyed him on turn 7. -I repositioned my forces in the northwest, digging in on mountains and hilltops to prevent a breakthrough in the north. -I began to move my motorized force across the mountains, however it never was able to make it to the battle. Perhaps a few turns earlier may have allowed it to be of more use. 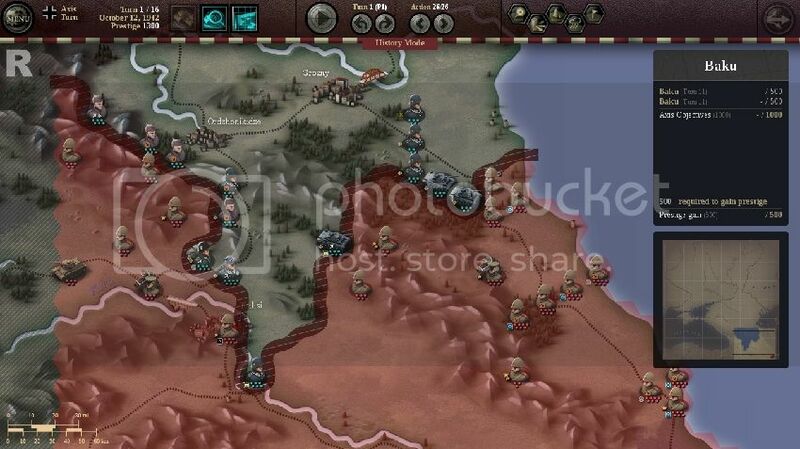 -By turn 7 I was adjacent to the western hex of Baku and had the city surrounded by the end of Axis turn 8. This allowed me to beat the bad weather and enemy reinforcements. 1. Protect your supply line! Without some intervention by your mechanized forces it is unlikely even dug in infantry will be able to hold the entire line. 2. Utilize your mechanized forces to destroy enemy units in the open terrain, moving them in and out of supply. Then moving them adjacent to Astrakhan by the end of turn 4. 3. 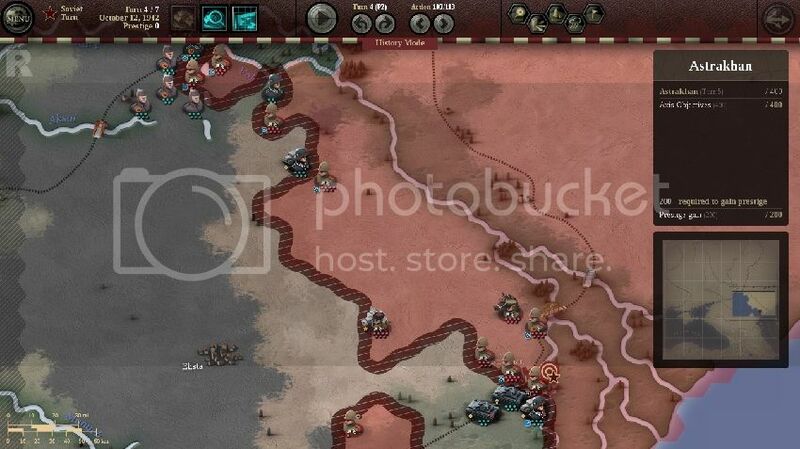 Have your mechanized forces supplied at the beginning of turn 4. After that it doesn't matter. -I had all of my mechanized forces attack the southern flank of the enemy line south of Stalingrad. 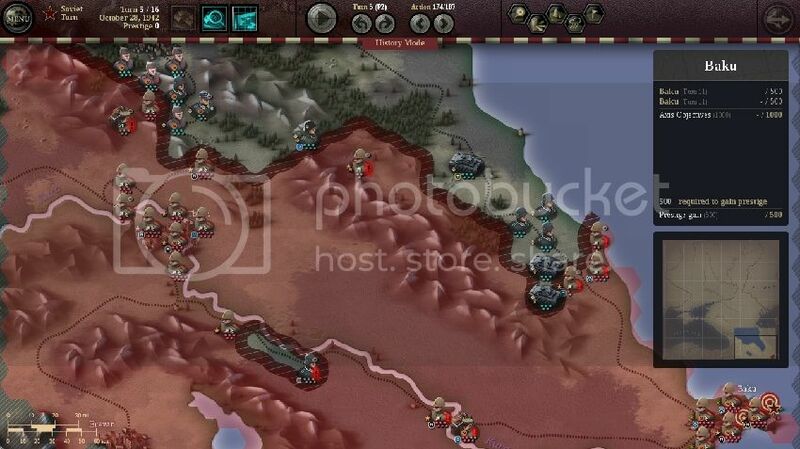 -I resupplied my motorized infantry in the south and moved him towards the north of Astrakhan. -I dug in most of my infantry forces along the line. -On turn two I captured the enemy supply point just east of Stalingrad in an attempt to disrupt his attack on my supply line. I had an infantry unit follow up to hold the point on the next turn. 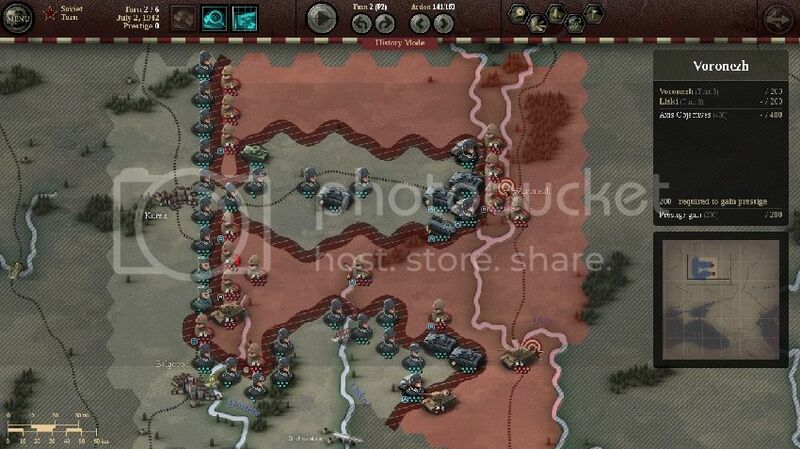 -Assured the enemy would not be able to interrupt my supply line I moved all but one of my mechanized forces south. 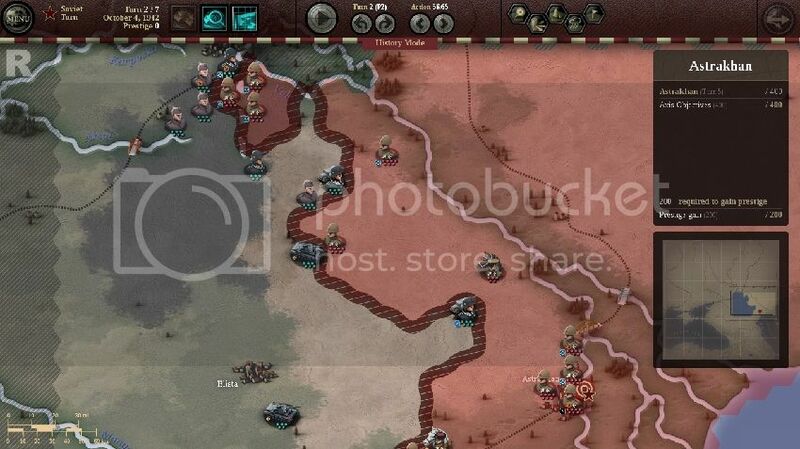 -During turns 2-4 I attacked units in the open terrain moving my forces in and out of supply. -I also kept the pressure on with one armored unit around Astrakhan resupplying him from the air. -At the end of turn 4 I was adjacent to Astrakhan ready to capture it on turn 5. Definitely one of the tougher scenarios in this game. A move-attack-move all the way to the objective combating tough enemy forces and bad weather. I have failed to find any tricks that might make for a sure win in this scenario, just some tips that may make your life a bit easier. 1. Send an infantry unit or two to the east side of the Volga River and have them travel north with your main force. Use them to capture enemy territory to keep partisans from obstructing your supply lines. They may also aid in destroying weakened units from across the river. 2. Send a Romanian unit to capture the supply line that forks to the west and then back to Saratov. Having this line secured limits the damage partisans or an unchecked enemy unit can do. 3. Keep a few Romanian and weakened infantry units in the rear to secure territory taken by partisans. 4. Utilize your infantry as much as possible early on. The weather will slow them down quite a lot midway through the scenario. 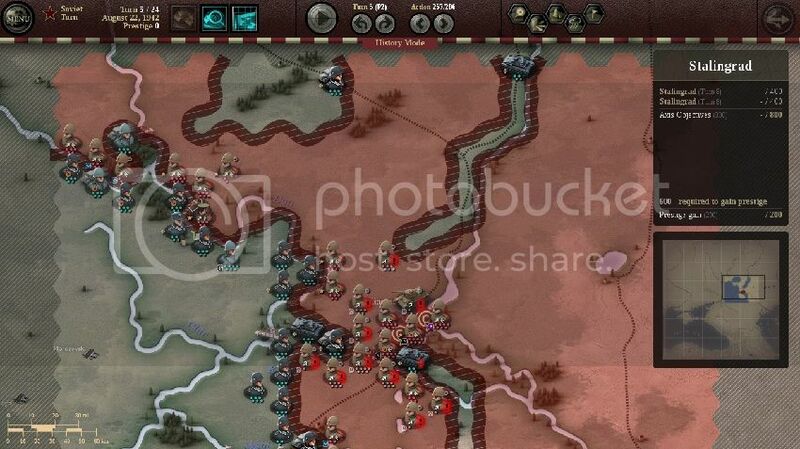 -I began by pushing north with my forces near Stalingrad, also attacking the infantry unit across the river in preparation to send my own unit across on turn two. -In the west I was able to punch a hole in the enemies line and successfully cross the Don. This action also took the two experienced Soviet units on the western edge out of supply. -During turns 2-5 I continued my advance north sending infantry units to capture the line west and units on the east side of the Volga. -At the end of turn 5 I was met with poor weather and a strong enemy force blocking my route to the objective. Time to slug it out. 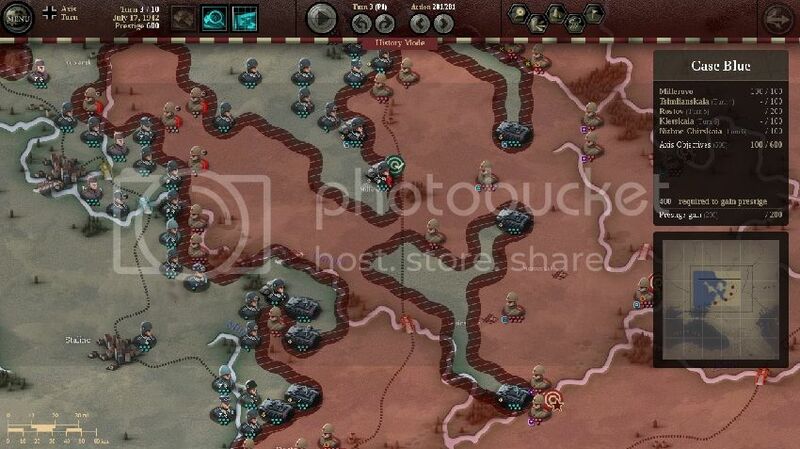 -During turns 6 and 7 the weather was poor and I was unable to make a huge dent in the enemy force. -Thankfully the skies cleared during turns 8 and 9 and I was able to secure Saratov. -During turns 10-14 the ground froze allowing my forces to quickly move to the final objective. 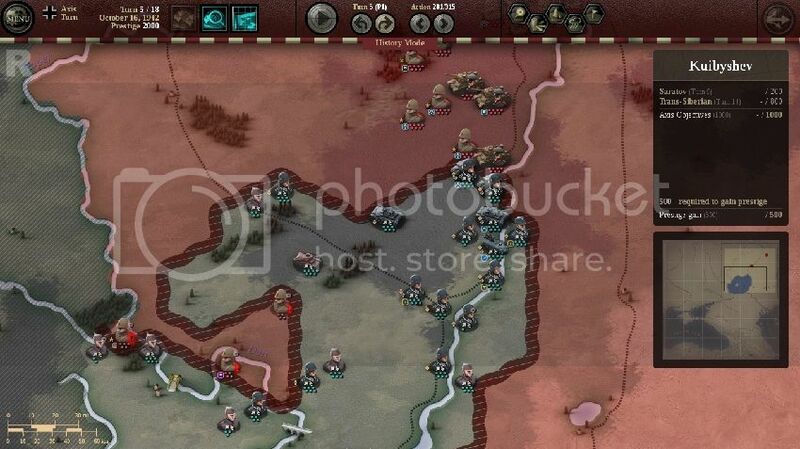 -I was able to maneuver many forces adjacent to the objective by the beginning of turn 14 and success was assured.